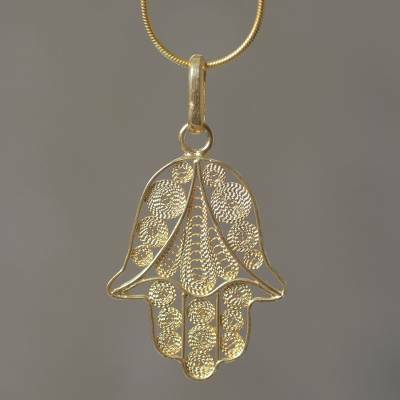 Gold Vermeil Filigree Artisan Crafted Hamsa Symbol Necklace, "Hamsa Symbol"
From Peru's Giuliana Valz-Gen, this beautiful pendant takes the form of an amulet known as the hamsa, which means "five" in Arabic. It is considered a defense against the evil eye. Popular in Jewish culture, its five fingers can represent the five books of the Torah and the fifth letter of the Hebrew alphabet, which represents one of the holy names of God. It is also a reminder to praise God with all five senses. Handcrafted of sterling silver bathed in 21k gold, the necklace showcases Andean filigree art. You can find gold vermeil pendant necklace 'Hamsa Symbol' by Giuliana Valz-Gen in jewelry categories such as Spiritual Necklaces, Bohemian Necklaces, No Stone Necklaces, Gold Necklaces, Vermeil Necklaces, Silver Necklaces, Sterling Silver Necklaces, Gold Necklaces, Gold Plated Necklaces, Pendant Necklaces and Filigree Necklaces. Enjoy exploring these sections for other Novica treasures.